A one-year-old Eurasian lynx named Lillith has been on the run from a Welsh zoo after last being seen in her enclosure on Thursday. So far, the pointy-eared cat has evaded both the staff of the Borth Wild Animal Kingdom in western Wales, and the local police. With recent sightings nearby, the zoo has closed in order to devote all resources to recapturing the animal and reuniting her with her mother and two siblings. Drones, a helicopter, and infrared cameras have all been deployed in the search for the cat, which has been nicknamed “Ghost Cat” due to its enduring disappearing act (and possibly a bit of Halloween in the air). As a last resort, specially trained police with firearms are on hand if the animal becomes an immediate public risk, which is highly unlikely. Believed to have escaped via a tree in the pen and a “giant leap” that allowed her to overcome a 16-foot fence and two electrified wires, Lillith was officially deemed missing on Sunday when staff did a full sweep of the enclosure. Zookeepers are blaming the inadequate pen as a reason Lillith’s absence took so long to verify. Lillith, who is about twice the size of a house cat, is tan and white with dark spots on her back legs and a short, stubby tail. She is believed to be capable of traveling 12 miles per day, which prompted the creation of maps of how far she could have traveled. Her potential whereabouts appear to cover all of Wales at this point. Having been been born and bred in captivity, officials believe the wild cat might choose to stay within relative proximity of her lifetime home and source of food. Police, who have spotted the lynx a handful of times from their chopper, are assuring the public that despite the cat’s long, sharp teeth, she is not a danger to the public. Dean Tweedy, who runs the small zoo with wife, told the Guardian that now it’s a matter of luring the cat back. Zookeepers are more concerned that Lillith will end up getting hurt out in the wild, either by worried farmers who may shoot her to protect their livestock, or a run-in with a vehicle. Eurasian lynxes are native across northern Europe and Asia. They were once common throughout Europe before being killed off in most of Central and Western Europe by the middle of the 19th century. 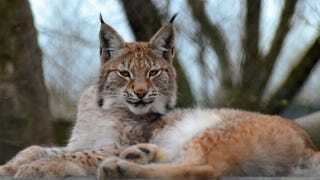 There are efforts to reintroduce the lynx to forests in its former range, including in the United Kingdom. After a 1,300-year absence, the Lynx UK Trust has announced plans to try and release a half dozen of the animals into several forests this year.